I love to make granola and my family loves to eat it up — all of them!! In fact, I have to make at least a double batch or I won’t have any for a meal. It gets eaten up as soon as it’s cool enough! Preheat oven to 250°F. Mix first 6 ingredients in large bowl. Melt butter with honey in heavy small saucepan over low heat. Pour over granola mixture and toss well. Spread out mixture on baking sheet. Bake 30 minutes, stirring every 10 minutes. Granola will not look completely dry when you get it out of the oven but will be perfect after it cools. Store airtight at room temperature. 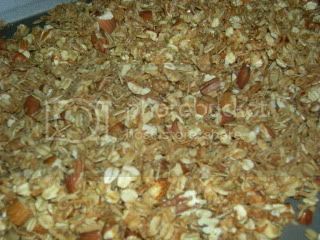 This picture is a batch of granola made months after the original post. I was lucky to get this shot before the granola was all gone. I almost had little hands in the picture!